The current director of IIM Udaipur (IIM-U) ‘Professor Janat Shah’ has been reappointed by the Ministry of Human Resource Development (MHRD) to serve second term as the Director of the institute. As per media a report, the Chairman of IIM-Udaipur has been conveyed about his reappointment by MHRD and official announcement of the same is expected on Monday. In one of media interviews Prof Shah expressed his ambitions as a Director of IIM-U. He said that he aims make IIM Udaipur as one of India’s Top-5 research institutes by 2020 and one of Worlds top research institute by 2030. He also said that "Building an educational institute is a 20-year journey but what one does in initial years has huge impact. We can take great satisfaction in having made an excellent start. I am pleased to have the opportunity to continue working with our impressive young faculty, highly motivated students and dedicated professional staff." Prof. Shah holds a degree in mechanical engineering from IIT Bombay and is a Fellow in Operations Management from IIM Ahmedabad. 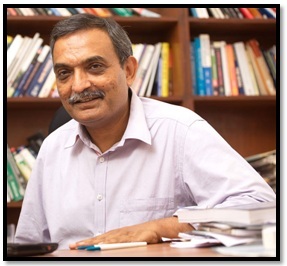 He is a faculty at IIM Udaipur and is passionate to teach courses in Operations Management. IIM Udaipur is ranked 5th among all Indian management institutions. This ranking was announced by the MHRD on April 4th, 2016 for the first time. Only IIM Bangalore, IIM Ahmedabad, IIM Calcutta and IIM Lucknow ranked higher. In the recent ranking list released by MHRD, the institute has received 15th rank. Please Subscribe with us to stay updated with the latest happenings in the Top MBA Institutes of India.